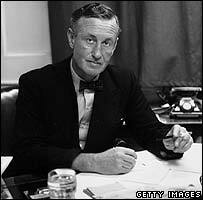 Letters written by James Bond creator Ian Fleming, due to be sold at auction next month, reveal a close relationship with his typist Jean Frampton. In one letter, dated 31 March, 1960, he asks her to use her "keen mind" to help get his novel Thunderball "into shape". "Anything your quick eye falls upon... would be endlessly welcome," he adds. "You can look on Mrs Frampton as Ian Fleming's Miss Moneypenny," said Amy Brenan of Duke's auctioneers in Dorset, which is offering the letters for sale. The auction will take place on 10 April to mark the centenary year of the writer's birth. The entire collection, which includes four signed letters by Fleming, is expected to fetch between £2,000 and £3,000. Also included are letters written by Mrs Frampton and Fleming's secretaries, Una Trueblood and Beryl Griffie-Williams. Hired to type the manuscripts of Fleming's books, Frampton found herself called upon to offer pointers on plot and literary style. "Your occasional comments on the work you have done for me have been so helpful," the author writes. Frampton, who lived in the Dorset town of Christchurch, is believed never to have actually met Fleming. Their correspondence, however, reveals a close relationship that extended to such Bond novels as You Only Live Twice and The Man with the Golden Gun. "The collection is interesting because it details how the James Bond books were put together in the early 1960s," said Ms Brenan.